Situated amongst the beautiful mountains of southeast Arizona, The Ritz-Carlton, Dove Mountain features breathtaking sights, two golf clubs, and a state-of-the-art spa. 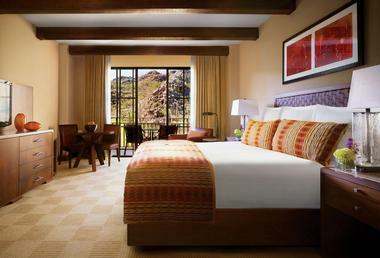 The Ritz-Carlton, Dove Mountain is ideal for family vacations, getaways with friends, or romantic trips. With a variety of guest rooms and suites, the Ritz-Carlton, Dove Mountain boasts Southwestern-inspired décor, modern amenities, and comfortable bedding. Each room offers high-speed Internet, marble tubs, and an LCD television. For standard guestrooms, visitors can choose from the Ridge View Room, Resort View/Mountain View Room, or Canyon View Room. At 450 square feet, these rooms can accommodate up to 4 guests. The Ridge View Room includes a king-sized bed, but in the other guestrooms, visitors can choose two queen-sized beds instead. Each includes a private balcony with views that differ based on room type. For more space, guests can also book one of the Ritz-Carlton, Dove Mountain’s suites. Canyon Suite - At 1400 square feet, the Canyon Suite offers visitors a private bedroom, two bathrooms, two balconies, and a large living space. The living space includes pull out couches for additional guests, sleeping up to 4 people total. The Superior View Executive Suite - The Superior View Executive Suite offers 917 square feet of space. Featuring views of the canyon, this room includes private sleeping areas, two balconies, and 1.5 bathrooms. It can accommodate 4 people. The Ritz-Carlton Suite - The Ritz-Carlton Suite has 2072 square feet of space. It offers three balconies, a two-sided fireplace, and separate areas for dining, living, and sleeping. It can accommodate up to four guests. Premier Suite - With 1333 square feet of space, the Premier Suite includes two balconies, a living room, a dining room, and a private sleeping area. It can accommodate up to 4 guests. Executive Suite - The Superior View Executive Suite offers 917 square feet of space. Featuring views of the mountains, this room includes private sleeping areas, two balconies, and 1.5 bathrooms. It can accommodate 4 people. Guests are also welcome to book one of the Ritz-Carlton, Dove Mountain’s Casitas. Situated in the Casita Village, these living spaces are secluded from the rest of the resort. Guests can book the Casita Suite, Casita Deluxe, or the Golf Casita Suite, which vary by the amount of space offered. Each provides unparalleled views of Wild Burro Canyon. The Ritz-Carlton, Dove Mountain also offers dog-friendly lodging. 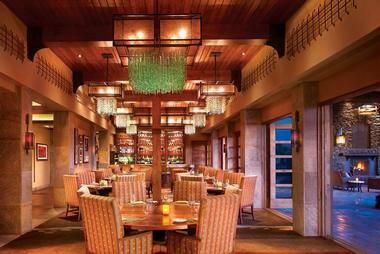 The Ritz-Carlton, Dove Mountain features a slew of dining options for guests to enjoy during their stay. CORE Kitchen & Wine Bar is a restaurant and bar that highlights local and seasonal cuisine that takes inspiration from Southwestern flavors. CORE is open for breakfast and dinner daily, as well as on weekend evenings for wine events. With more than 2800 bottles of wine available, CORE offers expansive wine list to customers. For visitors of the resort’s golf course, Cayton’s Burger Bistro is perfect for a casual meal and drinks after a day of recreation on the resort’s fairways. The restaurant offers indoor and outdoor dining spaces, as well as live music on the weekends. Situated beside the hotel’s pool and water slides, the Turquesa Latin Grill serves up Latin-inspired snacks, lunches, and beverages. Ignite is the Ritz-Carlton, Dove Mountain’s lobby lounge and sushi bar. They offer full bar service throughout the day, as well as fresh sushi and live music on the weekends. Guests can sit inside or outdoors to enjoy their beverages. Guests can also visit TolGo. This shop features baked goods, smoothies, and coffee. Visitors can also purchase a variety of light snacks from this establishment. 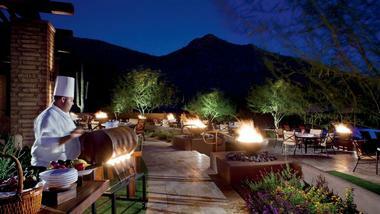 The Ritz-Carlton, Dove Mountain offers 24-hour in-room dining. For a day of rest and relaxation, guests can head to the Ritz-Carlton Spa, Dove Mountain. Visitors can order a variety of signature massages, body treatments, and facials. Nail services, hair styling, and waxing services are also available at the hotel’s salon. The Spa also offers a selection of gemstone treatments that are meant to promote the flow of energy throughout the body. Within the Spa, guests are also welcome to further the tranquility of their visit by taking part in one of the yoga, Pilates, or personal fitness sessions that are offered. The Ritz-Carlton, Dove Mountain boasts two golf clubs, the Golf Club at Dove Mountain, and the Gallery Golf Club. Both offer scenic views, well-landscaped terrain, and instruction by golf professionals. Each golf club includes practice facilities, a clubhouse, and a restaurant, as well as a golf shop. The Ritz-Carlton, Dove Mountain offers services for families through their Ritz Kids program. Ritz Kids Ranger Program - For children between the ages of 5-12, the Ritz-Carlton, Dove Mountain provides full- and half-day expeditions that are both fun and educational. In-Room Camping - Kids can enjoy “roughing it” from the comfort of their own room. The staff at Ritz-Carlton, Dove Mountain will deliver and assemble the children’s tent. This experience comes with a stuffed animal gift, as well as a book about the Sonoran Desert. The hotel also offers several packages for kids and their families that provide a range of services and experiences. 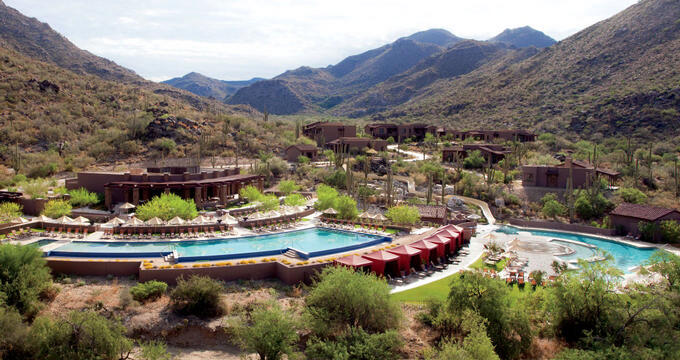 The Ritz-Carlton, Dove Mountain’s picturesque location and facilities make it ideal for gatherings of any size. Guests looking to book an event at the hotel will have a variety of available spaces from which to choose. Whether looking for a meeting space, classroom, or banquet hall, the hotel offers close to 44,000 square feet of indoor and outdoor space for visitors to rent for corporate retreats and weddings alike. Each facility is outfitted with a variety of technological and audio-visual equipment, and catering from the chefs at the Ritz-Carlton, Dove Mountain is available for any event. Available facilities include two ballrooms, a selection of boardrooms, and three outdoor lawn locations. Couples can also make their wedding-day dreams come true at the Ritz-Carlton, Dove Mountain. The hotel offers a range of indoor and outdoor venues that are perfect for weddings of any size and aesthetic. The resort supplies multiple wedding packages, rentable décor, culinary services, and ceremony coordination by an on-site wedding planner.